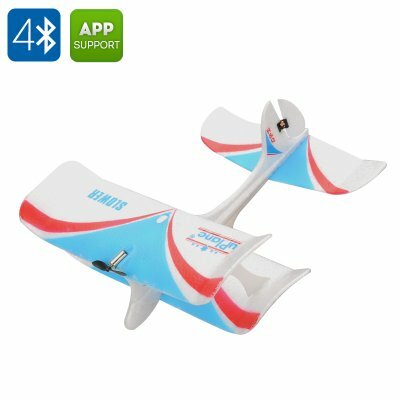 Successfully Added Bluetooth 4.0 Smartphone Controlled Airplane - Free App for Android and iOS, 80m Remote Distance, 10 Minute Flight Time to your Shopping Cart. Take to the skies with the gadget that is simple, fun and absolutely safe. If you enjoy the occasional thrill of flight but don’t feel like dropping the big bucks on a drone and going through the registration process, this mini plane is exactly what you need. Small enough to fit in your pocket and land on a magazine table, it can follow you anywhere. The mini plane is super compact and you can take it absolutely anywhere. Have a fun break at the office by flying the gadget in the meeting room, bring it along on a picnic or liven up a birthday party. The plane would also make the perfect gift for the little ones. Its super lightweight - only 10g - fits right in the palm of the hand and is easy to control. With only 220mm in length and 80mm in height, the plane takes off by being activated and hand laucnehd into the air. It can stay in the air for up to ten minutes and its 3.7V 50mAh battery can be easily recharged via a USB cable in next to no time. The plane is easily controlled by your smartphone or tablet via Bluetooth. Thanks to the support of Bluetooth 4.0, the communication between the two gadgets is fast and effortless – the mini airplane will instantly obey your commands in the air. Download a free app for your smartphone or tablet and you are all set to start flying. The airplane comes with apps for both Android and iOS – so, no matter what operating system you prefer, the mini remote controlled airplane will be the right fit. The Mini Bluetooth Airplane brought to you by the leader in electronic devices as well as wholesale cool gadgets and remote control toys..